I have been on several hunting ranches over the years and this is one of the best! As you drive into the property you notice the great habitat for hunting. The property has deep valleys with live creeks and open bottoms. There are several miles of trails that are maintained throughout the year. There are several enclosed elevated stands through out the property to maximize the amount of hunters that can be in the field. The facilities for maintaining the property are top of the line. All the buildings have concrete floors and are insulated. The shop has 3 overhead doors to allow larger equipment to be brought in for maintenance. There are 2 offices inside the shop building, full kitchen and bathroom. 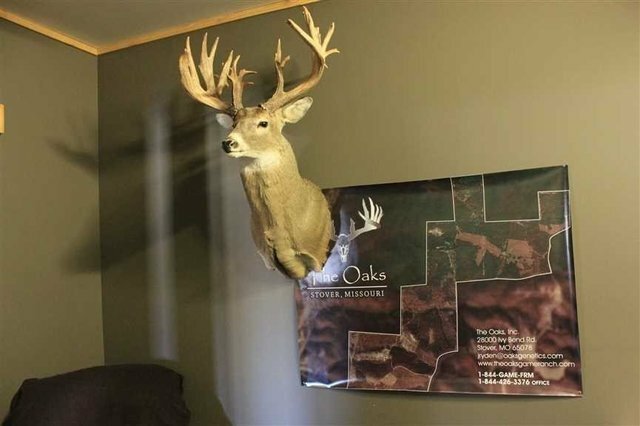 The deer handling building is state of the art for working deer. There are holding pens inside the building and a enclosed chute to bring the deer into the squeeze chute. The cabin on the property is used for the guides to stay in during hunting season. Hunters stay at the leased lodge about 10 miles away from the ranch. You won't find a better hunting property for the money with all this one has to offer. There's so much more to this property! Call Dan @ 816-566-4008 to schedule your private, guided tour today!